During the fall semester of 2017, the students of Badger Rock Middle School made books for students in Guinea. The teacher who began this project, Maya Kadakia, is the English-Language Arts teacher at Badger Rock. Ms. Kadakia went on a year-long trip to Guinea to study dance and teach English. In Guinea the weather is hot and humid, which left her exhausted. With the lack of energy, she found it hard to speak in two languages all the time. While there, she read the books she brought with her three times each because there weren’t many books for her to get at the local library. Both Maya Kadakia and her husband Mandjou Mara—a master drummer and singer from Guinea—organized the annual “Beats for Education event”. “Beats for Education” is a fundraising event for the Fansiga Village School in Guinea. Books are not easy to get in Guinea, so students at Badger Rock Middle School went to work writing and designing books that the students received last month. Most children and teenagers do not have a way to get books and those who do, have only a limited access. Many schools in Guinea, don’t even teach with books because they are not easily obtain. “They are going to get education,” said Devika Pal, a 7th grade student at Badger Rock, “Education is very important.” Most students created books in English, that were translated into French which is the main language spoken in Guinea. The rest of the students made books in both English and French. The students that made books only in English had them sent to Lindsey Smith-Fass of the University of Wisconsin French Department. The books were sent to be translated into French. After the final draft of the books was written and printed, the books were laminated and then assembled by the students. The variety of book themes ranged from poems to stories. Two students even wrote a book about soccer, which required Smith-Fass to think “outside the box” in order to translate their books. The Republic of Guinea is a country in West Africa. 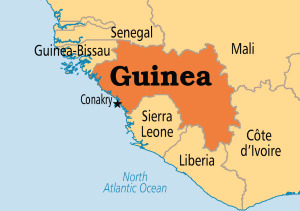 Guinea is sometimes referred to as Guinea-Conakry, not to be confused with Guinea-Bissau or Equatorial Guinea—two other countries in Africa—or the island of Papua New Guinea in Oceania. Guinea is slightly smaller than the state of Oregon in the United States with its capital, the city of Conakry, being the largest population center of Guinea. According to the Central Intelligence Agency (CIA) the population of Guinea is 12,413,867. Its population is young with about 41.52 percent made up of children and young teenagers from birth to fourteen years of age.